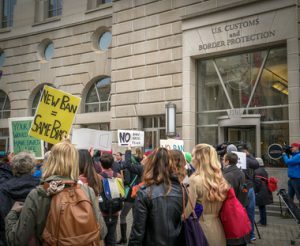 The Trump Administration’s travel ban, and it’s many struggles in the courts, have been all over the news—on this blog and elsewhere. It’s been shot down, rewritten, shot down again, appealed and appealed again, and now the U.S. Supreme Court has finally had their say on Trump’s second crack at his immigration ban, temporarily barring Syrian refugees and entry to the U.S. from six Muslim-majority countries (Somalia, Sudan, Yemen, Iran, Syria, and Libya). Their preliminary opinion, final hearings are yet to come, was a unanimous ruling that the provisions of the second ban are constitutional and can be put into force—with some caveats. Let’s take a look at the Supreme Court’s unsigned opinion from last week and see exactly what it does and why they say they ruled the way they did. According to the Supreme Court this includes situations where somebody is trying to enter the U.S. and can show that they have a close family member, they have a job waiting for them in the country, or they’ve been excepted to a university. These specific situations certainly create an exception to Trump’s order, allowing people in these situations to enter the U.S. regardless of the order. However, these situations are offered as “illustrative” of a bona fide relationship rather than an exhaustive list. This means that the door is open to figure out situations which create similar levels of bona fide relationship. Unfortunately, the Supreme Court was not forthcoming with analysis of how to determine when these situations exist outside their specific examples. To be honest, they weren’t even particularly clear about the outer bounds of their specific examples-as we’ll see when we talk about the implementation and legal backlash to this order. So why did the Supreme Court give the travel ban order its ok? While the three most conservative Justices would have been happy to allow the order to go forward without caveat, the bona fide relationship compromise was largely responsible. The Court looked at the public interest requirement of an injunction and balanced the interest of the U.S. public in being allowed access to the U.S. against the national security interests claimed by the government. Whether or not you agree with them, the Supreme Court determined that the hardships caused to the U.S. public (citizens specifically) are substantially alleviated if those with bona fide relationships to those citizens are allowed entry into the country. With the caveat in place, the Supreme Court unanimously felt that the remaining hardship the order caused was outweighed by the governments historically strong interest in national security. In the last week they have released what they consider to be the outer boundaries of what constitutes a bona fide relationship. Familial relationships are limited to parents, spouses, fiancés, sons, daughters, son or daughter-in-laws, or siblings already in the U.S. This notably, and as we’ll see later contentiously, excludes grandparents, grandchildren, aunts and uncles. When it comes to business, employment, or university relationships will need to be formally documented. Relationships of this sort will not be allowed if they are formed “for the purpose of evading the ban.” It’s not clear how these situations will be identified. Students, employees, lecturers, and journalists can get into the county if they have a “valid” invitation or employment contract. Again, there is little to define what makes a document valid. Ultimately, even these clarifications need clarifications to avoid chaos. TSA agents are ultimately going to be deciding who has a bona fide relationship, a ridiculous requirement for anybody who isn’t an immigration attorney unless we can have very clear rules of what constitutes a bona fide relationship and how somebody can hope to prove that such a relationship exists. As it is, the situation is too vague to continue. Many predicted lawsuits to quickly follow the Supreme Court’s ruling, and they already have been proven right. Just last week, right after the Department of Homeland Security published their guidelines, Hawaii filed an emergency motion asking a federal court to rule that the guidelines violate the Supreme Court’s order by excluding relationships such as grandparents and uncles. They’re asking the court to say that the Trump administration cannot enforce the guidelines as written. The Supreme Court’s order is incredibly vague and Hawaii’s is unlikely to be the last lawsuit stemming from the ruling. However, the truth is that the order is just the tip of the iceberg of what’s to come. The real hearings on this case won’t be in front of the Supreme Court until October. Until then, we’ll be left trying to parse the puzzle of the outer bounds of a bona fide relationship.